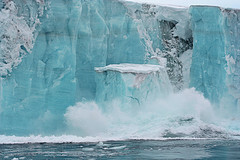 Loss of ice in the Arctic, and in particular the extensive sea-ice, has global implications. The “white parasol” at the top of the planet reflects energy from the Sun straight back out into space, helping to cool the Earth. Further loss of Arctic ice will see radiation absorbed by darker seawater and snow-free land, potentially warming the Earth’s climate at an even faster rate than current observational data indicates.